The musicians we surveyed are highly wired and engaged online. The data on musicians referenced throughout this section of the report was gathered through a non-random online sample of 2,793 musicians, songwriters and music publishers, recruited via email notices sent to members of various music organizations, through announcements on those organizations’ Web sites and through flyers distributed at several musicians’ conferences. Our analysis focuses on 2,755 musicians and songwriters within that sample. The survey was live on the Web from March 15-April 15, 2004. Musicians are an exceptionally mobile and elusive population, and thus difficult to identify and reach by traditional telephone survey methods. The costs and practical difficulties of doing a phone survey with this population are often prohibitive. In our case, using a non-random sample allowed us to reach a population that we otherwise would not have been able to reach. The results reported from this survey are intended to provide insight into the behaviors and attitudes of a unique, understudied group. The survey questionnaire was built from a questionnaire that was reliable in two prior random digit dial, national, representative telephone surveys. Non-random samples cannot be projected to the entire population of musicians, songwriters, and music publishers. But they can be valid for giving a sense of the relative proportion of opinion in various segments of populations. Since the data are based on a non-random sample, a margin of error cannot be computed. The musician sample is composed of those who consider themselves to be either songwriters or musical performers. Some of these songwriters and musical performers are also music publishers. However, those who reported being exclusively music publishers (and not songwriters or performers) were considered ineligible to respond to all but a few of the initial questions of the survey because artists were the central focus of our study. Some 53% of the sample say they are primarily songwriters, 44% say they are primarily musical performers, and just 3% say they are primarily music publishers. However, the vast majority of these musicians are filling multiple roles. Some 94% say they are songwriters, 90% say they are musical performers and 46% say they consider themselves music publishers (in addition to being either a songwriter, performer or both). Most musicians in the U.S., according to the U.S. Department of Labor’s Bureau of Labor Statistics (BLS), rely on secondary sources of income to supplement their musical work.24 In the 2004-2005 edition of the Occupational Outlook Handbook, the BLS finds that, “The stress of constantly looking for work leads many musicians to accept permanent, full-time jobs in other occupations, while working only part time as musicians.” This truth about moonlighting was clearly reflected in our sample. Aside from songwriting and performing, more than three-quarters of our musician respondents, 78%, said they have another job where they work for pay. Some 8% of the musicians surveyed said that 100% of their annual income is derived from being a songwriter or musical performer (including royalties collected from work done in previous years). Another 8% are in the creative upper crust of those who earn 60%-99% of their total income from music, and 12% get anywhere from 20%-59% of their annual earnings from music. The largest bracket consists of the 41% of respondents who earn less than 20% of their total income from music. One quarter of our sample do not currently receive any money from being a songwriter or musical performer. For those who do currently receive income from their music, most of their earnings come from touring or live performances. Second to that source are royalties that come from traditional CD sales. Among the most popular genres of music composed, performed or published by these musicians are independent, pop, folk, modern rock, country and adult contemporary. 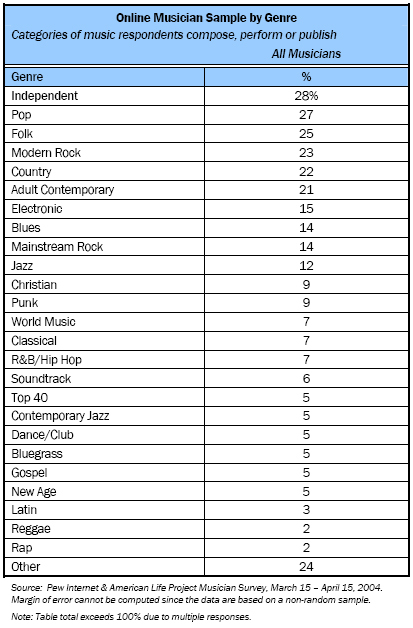 And while our sample is not representative of all musicians, the demographic makeup of the sample does reflect some trends that are congruent with the musicians in our callback sample, such as the finding that a disproportionate number of musicians are male. Musicians’ experiences with the internet are shaped by their individual reliance on music. The personal experiences and everyday realities of musicians’ lives play an important role in shaping their online behavior and attitudes towards the internet. For example, musicians who are struggling to make a name for themselves may welcome any type of exposure for their work and thus might have very different concerns about copyright protection compared to established artists who have traditionally relied heavily on royalties earned from CD sales. Further, having the capability to collaborate with other artists online or schedule performances using the internet would likely be less beneficial for non-working musicians than it would be for those actively developing their careers. These online musicians have integrated the internet deeply into their musical lives. In this highly-wired sample, 88% of the respondents said they go online from home once a day or more, and 57% said they go online from work at least once a day. In a separate question, 76% of these online musicians reported using the internet or email in a way that is related to their music once or more per day. Digging deeper within the online musician sample, even larger segments of both Success Stories and Starving Musicians report this level of use; 91% of Success Stories and 88% of Starving Musicians report music-related internet and email use at least once a day. Part-timers and Non-working Musicians are less likely to report this; 67% of Part-timers say they engage in this level of daily use and 65% Non-working Musicians say this. Wireless access is already important for some musicians. Musicians often live lives that require them to travel extensively, so wireless access can be a crucial resource for getting work done while on the road or for staying in touch with family and friends. The findings from our survey suggest that wireless access may become increasingly important and integrated into daily life for certain portions of the musician population. Among the musicians responding to our survey, more than one-third reported using wireless technology – a laptop, PDA or cell phone – to access the internet. That is almost twice the portion of the general population of internet users who say they go wireless. In our February 2004 tracking survey, 17% of all online Americans responded “yes” when asked if they ever “log onto the internet using a wireless device” and 6% said they do so on a typical day.27 In contrast, roughly 16% of our musician sample said they use wireless technology to go online at least once a day or more. Musicians connect and collaborate online. Like much of the general public that we survey, these musicians feel better connected to one another, and better able to stay in touch with family and friends because of the internet.28 While 56% of the musicians in our sample say they use the internet to keep in touch with family and friends while touring, 81% of Success Stories and 72% of Starving Musicians say this. And the majority of full-time, working musicians say the internet has had a big effect on making it easier to stay in touch with family and friends while they are on the road. 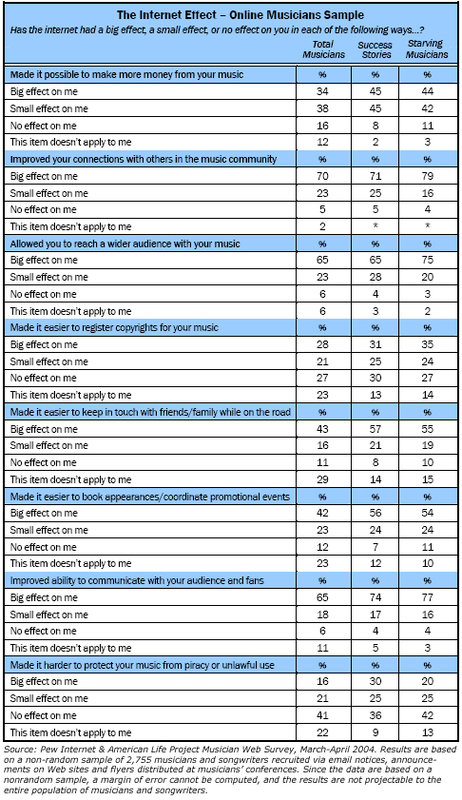 Nearly every respondent in our sample also reported some level of improvement in their connections with others in the music community; 70% say the internet has had a big effect on these connections, 23% a small effect, and just 5% reported no effect. Starving Musicians are the most likely to report that the internet has had a big effect on improving contacts (79% say this). Success Stories fall in line with the average at 71%, while Part-Timers and Non-Working Musicians report lower levels of impact (64% and 63%, respectively, report that the internet has had a big effect on improving their music community connections). Specifically, 89% of all the online musicians in our sample who use the internet or email for their music say they keep track of what other artists in their field are doing online and 66% say they actually collaborate with other artists online. Musicians seek information, tools, and support online to help them create. Though much public attention has been devoted to the way the internet has altered the fate of the physical music product, it has also had a formative role in shaping the way musicians create their works. Musicians now have access to a wealth of music knowledge and tools online: music composition and recording software, educational materials, music libraries, other communities of musicians, and music blogs (to name a few). Almost all musicians in our sample (90%) say they do research for their music online and 75% say specifically that they seek inspiration online (by reading, looking at images, or listening to music, for example). 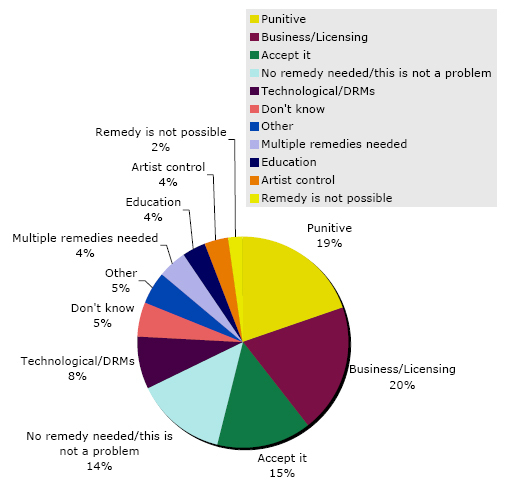 Some 37% of all musicians and songwriters in our sample say they have used the internet or email to help them locate creative work from the public domain that is free to use without permission, or to find out if another artist’s work is legally available for them to use, while 63% say they have not done this. But another 32% say they don’t generally know whether content is part of the public domain, or know how to go about finding out if it is legally available to use. Musicians also have unprecedented access to a huge inventory of musical instruments and other musical equipment available for purchase online. Finding appropriate instruments and other specialized audio equipment offline often requires large investments of time and money, particularly for those musicians who do not live in close proximity to musical equipment stores. However, the online marketplace has introduced new opportunities for comparative shopping on a global scale, including access to a growing supply of used instruments and other gear. And while it is likely that many musicians will still want to hear and test out their instruments before making a major purchase, 79% of the respondents who use the internet for their music say they have ordered some type of musical equipment online. Extensive outreach efforts by various non-profits and arts advocacy groups have successfully utilized the internet to increase access to information about funding sources for artists. Indeed, half of all the online musicians who responded to our survey say they use the internet to look for sources of artist funding. More specifically, our findings suggest that those who need the funding the most, are the most likely to seek it online. For example, 62% of Starving Musicians say they sought funding information online, compared to 51% of Success Stories. Increasing access to health insurance information for musicians has also been recognized as a critical issue by artist groups. Due to the unstable nature of employment for most musicians, they are typically required to seek and purchase their own health insurance coverage through national insurance networks or artist organizations. However, some research has suggested that many musicians are not aware of these discounted plans. For others, even the discounted plans are prohibitively expensive.29 Relative to other online activities, seeking health insurance information for artists ranked very low among the musicians we polled; just one-quarter of all the respondents said they had investigated health insurance online. However, in previous research conducted by the Pew Internet Project on the general public’s use of the internet to seek health information, the same modest portion of all American adult internet users, 25%, said they had sought health insurance information online.30 Furthermore, within our musician sample, among Success Stories, the number of online health insurance seekers jumps to 38%. Within the Starving Musicians population it climbs to 30%. Musicians now book performances and promotional events online. The internet has also generally had a positive impact on the day-to-day tasks of scheduling and coordinating performances and other promotional events. Processes that used to require long games of phone tag and expensive press kit mailings can now often be simplified with the use of email and artist and venue Web sites. Among full-time, income-earning musicians who responded to our survey, more than half say that the internet has had a big effect on making it easier to book appearances and coordinate promotional events. Looking within subcategories, 56% of Success Stories and 54% of Starving Musicians say this. Another 24% of each group of respondents report that the internet has had a small effect on the ease of booking and event scheduling. In all, 62% of musicians who use the internet in a way that is related to their music say they book performances online, and 55% say they schedule promotional events. Not surprisingly, those who work more regularly are more inclined to have done this; 80% of Success Stories and 74% of Starving Musicians who responded to this question say they use the internet or email to book performances. Similarly, 71% of both Success Stories and Starving Musicians say they schedule promotional events online. Some 42% of all musicians in our sample who use the internet for their music say they keep in touch with an agent or management staff online, but this is strongly influenced by the Part-timers and Non-working Musicians in our sample who may not have active management staff. Among Success Stories, 67% report communicating with their agents and management online, and 54% of Starving Musicians communicate with agents and management electronically. Two out of three musicians in our survey note that the internet has had a big effect on improving their ability to connect with their audience. In addition to the internet’s effect on internal communication within the music community, musicians report substantial shifts in their opportunities to connect with fans online. Two-thirds of those in the online musician sample say the internet has had a big effect on improving their ability to communicate with their audience and fans of their music. Another 18% report a small effect and only 6% say they have not observed any improvement in communication. 11% say the question does not apply to them. When asked if the internet had allowed them to reach a wider audience with their music, the same portion, two-thirds say they have observed a big effect. About a quarter say the internet has had a small effect on their audience reach and 6% said there has been no effect. For another 6%, the question does not apply. Inexpensive and efficient contact with fans via email and Web sites is quickly replacing what was previously a cumbersome and costly reliance on the postal service and the telephone. Several musicians told us that they think of their web pages as “electronic business cards.” Email lists provide a convenient way to send fans frequent and personalized news and updates and online fan communities thrive with and without the participation of the artists themselves. Musicians can stay connected to their community of listeners while they’re on the road, they can customize email messages and change set lists in response to fan requests, or they can test market a new song, for example. Many popular musicians are also offering advance album and ticket sales online as an exclusive benefit to their fans. Fully 84% of the respondents who use the internet or email for their music say they keep in touch with fans of their music online and more than three-quarters (78%) say they look for reviews and other feedback from fans online. Among Success Stories and Starving Musicians, 93% of each group say they keep in touch with fans online. Searching for reviews and fan feedback is done by 89% of Success Stories and 87% of Starving Musicians. Of all the musicians who responded to our survey, 44% say that they use email, message boards or chat rooms to communicate with their fans at least once a week. In comparison, 53% of Success Stories say they communicate with fans online once or more each week and 52% of Starving Musicians say this. In response to an open-ended question, many musicians told us that the most significant impact the internet has had on their careers is the ability to be better connected to fans and other musicians who can offer both encouragement and criticism. One respondent explained: “Being able to get instant feedback has really made me look at my work differently and has helped me grow as an artist.” Another musician noted how important the internet has been in enabling her to keep in close contact both with new fans and those reaching back over twenty-five years. Most of these musicians have a presence in the online marketplace. Of course, connecting directly with fans online is merely one type of promotion that the internet affords. Overall, 87% of the musician respondents say they promote, advertise or display their music online, and 83% provide free samples or previews of their music on the internet. More than three-quarters (77%) of all the online musicians who completed our survey say they have their own Web site and nearly half all the respondents have a Web site they built themselves. About 85% of both Success Stories and Starving Musicians have their own site, compared to 80% of Part-timers and just 64% of Non-working Musicians. Do-it-yourself Web design is most common among Starving Musicians and Part-timers, who may not have the resources to hire a professional graphic designer or web developer. Still, 40% of all Success Stories have a Web site that they built themselves. 46% of Success Stories have a Web site that someone else built for them, and just 15% say they don’t yet have their own home on the Web. Among all musicians who have their own Web site, 62% say they sell their music directly from the site. Virtually all of these musicians sell their music on CD, and about one in five who sell music from their site offer both CDs and individual songs for sale. However, there are many other online venues where artists can sell their music. Musicians may have online distribution through their record label, an online music distribution service (like CD Baby or Amazon), or they may set up an online shopping cart using PayPal or a similar service. In all, 69% of the respondents to our survey say they sell their music somewhere online. And close to two-thirds of all the online musicians who responded to our survey (63%) say that they sell their music online someplace other than their own Web site; 56% sell CDs through online stores like Amazon.com or CDBaby, 28% sell downloadable files through digital stores like iTunes, and 18% sell their music someplace else online. Most musicians we surveyed report that the internet generally seems to have a positive, if sometimes only minor, impact on their music sales. The majority of musicians we polled felt that the internet’s net effect on sales has been positive for them, with surprisingly little variation according to income. When asked to what degree the internet had made it possible to make more money from their music, two out of five income-earning musicians says they have observed a big effect. Looking across income brackets, 43% of online musicians who earn 80%-100% of their annual income from music, 43% who earn 20%-79% from music, and 39% who earn less than 20% from music say the internet has had a big effect on increasing sales opportunities. Similar portions of each income group reported a small positive effect, and about one in every ten income-earning musicians say they have not observed this effect. Overall, 34% of online musicians say the internet has a big effect on increasing the amount of money they could make, 38% report a small effect, and 16% say it has no effect. Twelve percent of all online musicians say the question doesn’t apply to their situation. Having online mechanisms in place for artists to track sales and royalties easily is a major development for working musicians engaged in the business of their music, akin to the advent of online banking tools for the general public. However, while the majority of full-time, income-earning musicians who responded to our survey have already tried tracking their sales, charts or royalties online, there is still room for growth in this activity relative to the popularity of other music-related activities online. Looking again at subcategories, 57% of Success Stories say they use the internet or email to track their sales or chart position and 59% of Starving Musicians say this. Likewise, 43% of Success Stories and 42% of Starving Musicians check their royalties online. Three out of four musicians in our survey seek information about copyright laws online. Before a song is released to the public, many musicians and songwriters choose first to register that work with the U.S. Copyright Office.32 Our findings here suggest the internet is playing a considerable role in facilitating copyright education. Two-thirds of all the musicians who responded to our survey say they look for information about copyright laws and regulations online. And within the various subcategories, Starving Musicians are the most likely to seek information about copyright laws online (74% of these full-time, lower income-earning artists do this), while Success Stories, Part-timers and Non-working Musicians are all equally as likely to seek information (64% of each group do this). Though musicians cannot currently register their works online through the U.S. Copyright Office’s Web site (an online registration feature should be available in 200533), they can acquire the forms and find directions there. Legal Web sites such as www.legalzoom.com do offer an online copyright registration service that includes assistance in the preparation and mailing of the application, but the copyright owner still must submit a hard copy of the work. When asked if they had used the internet to register the copyrights for their work, 46% of all musicians who use the Web in some way for their music say they have done this. That compares to just over half of full-time income-earning musicians who use the internet to help them register copyrights. But without the online submission feature, the application process is still cumbersome for many. Just over one in four of all online musicians who responded to our survey say the internet has had a big effect on making copyright registration easier. Musicians are divided over downloading. Echoing the sharply conflicting opinions within the ongoing public debate about file-sharing, musicians are equally divided over file-sharing services’ impact on artists. There is no clear consensus regarding the effects of online file-sharing on artists. Some 35% of our online musician sample agree with the statement that file-sharing services are not bad for artists because they help promote and distribute an artist’s work; 23% agree with the statement that file-sharing services are bad for artists because they allow people to copy an artist’s work without permission or payment. And 35% of those surveyed agree with both statements. The responses of Starving Musicians resembled those of the total sample, but Success Stories were more likely to agree that file-sharing services are generally bad for artists (35% said this). Assessing the impact of free downloading on their careers as musicians, 37% of those in our sample say free downloading has not really made a difference, 35% say it has helped, and 8% say it has both helped and hurt their career. Only 5% say free downloading has exclusively hurt their career and 15% of the respondents say they don’t know. Not surprisingly, Starving Musicians are more likely to say free downloading has helped and Success Stories are less likely to say it has helped their careers. Still just 13% of Success Stories say that free downloading has only hurt their career and 16% say it has both helped and hurt. Of the small group of all musicians who say that free downloading has exclusively hurt their career (n=138), a clear majority (61%) identify themselves as primarily songwriters or composers, rather than performers. Asked whether online music file-sharing has made it harder to protect their music from piracy, 16% say the internet has had a big effect in allowing piracy of their music, 21% say it has had a small effect, and 41% say it has had no effect. Among Success Stories, twice as many say the internet has had a big effect on increasing piracy (30%), while 25% report a small effect and 36% say the internet has had no effect. Musicians are split in assessing blame for free file-sharing. Who should be held responsible for illegal file-sharing online? Musicians in this sample are most likely to say that both those who run file-sharing services and individuals who swap files through those services should be held responsible; 37% of the total sample say this. But 21% said no one should be held responsible. Some 17% said those that run peer-to-peer services should exclusively bear the legal burden, and 12% said individuals who swap files should exclusively bear the burden. Success Stories are even more likely to say that both the services and individuals should be held responsible (48%) and are less likely to say that no one should be held responsible (13%). Regardless of how much they rely on music for their livelihood, most musicians and songwriters think file-sharing on the internet poses some threat to creative industries that make music and movies. One-third of the respondents to the musician survey say file-sharing poses a “major threat” to these industries while one-third say it poses a “minor threat.” Another third say file-sharing poses “no threat at all” and 7% say they don’t know. Success Stories are more likely to say they think file-sharing poses a major threat (45% say this) and less likely to say it poses either a minor threat (26%) or no threat at all (20%). One in six of the musicians we polled say they have actually been involved in advocacy or lobbying efforts regarding the issue of copyright infringement or music downloading. 67% of the musicians in our survey say copyright owners should have complete control over the material they copyright, and most say copyright laws do a good job of protecting artists. Fully 61% of those in this sample believe that current copyright laws do a good job of protecting artists’ rights, but 59% also say that copyright laws do more to protect those who sell art than to protect the artists themselves. Most of the musicians and songwriters we polled do not believe current copyright laws “unfairly limit public access to art.” Some 46% disagree with this statement and 21% strongly disagree. However, 15% do agree that current laws unfairly limit public access to art, 8% strongly agree, and 10% say they don’t know. Half of the musicians and songwriters surveyed say they would be bothered if someone put a digital copy of their music on the internet without permission (compared to 37% who say they would not be bothered and 12% who say they don’t know). Some 28% of all musicians and 44% of Success Stories say they have experienced this situation firsthand. When asked if they would want CDs or digital audio files of their music to be copy-protected so that copies could not be made without their permission, 44% said yes, 44% said no, and 12% said they didn’t know. Starving Musicians were equally split, but 59% of Success Stories said they would want their music to be copy-protected compared to 28% who said they would not want this. Most musicians in our sample do not think that people who intentionally break or disable copy protection mechanisms on CDs and DVDs should be prosecuted for copyright infringement; 46% say this, while 35% say that those who disable copy protection should be held responsible, and 19% say they don’t know. However, Success Stories are more likely to believe those who break copy protection devices should be prosecuted. Most of these musicians do not think that downloading or sharing media files on peer-to-peer networks without permission should pass the fair use test. However, a majority think that sending a copy of music over the internet to someone you know should be permissible. While just half of our online musician sample thinks they are somewhat or very familiar with the “fair use” portion of copyright law, they agree with many of the practices that are commonly understood as fair uses of copyrighted material. Nearly all of the musicians in the sample agree that activities such as recording a movie or a TV show on a VHS tape, or making a photocopy from a book or article for personal use should be allowed. Posting an excerpt of a story or article online to critique or comment on it is also viewed by nearly all the respondents as an activity that should be considered legal, as is act of ripping a digital copy of music onto a personal computer from a purchased CD. However, when asked about sharing copyrighted content online, the level of tolerance decreases as the potential scope of distribution increases. For instance, most musicians, including Success Stories, think that sending a digital copy of music over the internet to someone you know should be considered legal, but clear majorities do not think downloading and file-sharing on peer-to-peer networks should qualify as fair use of copyrighted material. Similarly, these musicians clearly see copying for commercial use as unacceptable and not within the realm of fair use. Some 95% of our sample says that making copies of music, movies or television programs and selling them to other people without permission from the copyright holder should be illegal. On the other hand, there is no clear consensus on whether burning a copy of a CD or a movie for a friend should be permissible; 47% think this should qualify as a legal fair use, while 41% think this should be illegal, and 12% say they don’t know. They are similarly divided over the prospect of copying a computer program like Microsoft Word or Photoshop for personal use; 40% think this should be legal, 45% think it should be illegal, and 15% say they don’t know. Yet, Success Stories stand out as being wary both of burning CDs or DVDs and copying computer programs; roughly one-third of this group thinks these activities should be legal under fair use provisions, while about half say they should be illegal. 83% have provided free samples of their work online and significant numbers say free downloading has helped them sell CDs and increase the crowds at concerts. Fully 83% of those in the survey say they provide free samples or previews of their music online. Strong pluralities say free downloading has a payoff for them. For instance, 35% of them say free downloading has helped their careers and only 5% say it has hurt their careers. Some 30% say free downloading has helped increase attendance at their concerts, 21% say it has helped them sell CDs or other merchandise; and 19% say it has helped them gain radio playing time for their music. Only a small number cite any negative impact of downloading on those aspects of their work. However, Success Stories are less likely to note positive impacts. Many of these musicians and songwriters do not think the RIAA campaign against free file-sharing on the internet will benefit them, though responses varied according to one’s personal experience with unauthorized downloading. Many of the musicians we polled do not think the recording industry’s legal efforts to stem the tide of free sharing of music on the internet will benefit those who create and perform music. Some 60% of those in the sample say they do not think the Recording Industry Association of America’s suits against online music swappers will ultimately benefit musicians and songwriters. Those who are working full-time and earn the majority of their income from music are more inclined than struggling musicians to back the RIAA, but even those deeply invested musicians do not believe the RIAA campaign will help them. Some 43% of Success Stories do not think the RIAA legal efforts will help them, while 36% do think those legal challenges will ultimately benefit them. However, many respondents find this question difficult to answer; 18% of all musicians say they don’t know if the legal campaign will ultimately help them and 22% of Success Stories say they don’t know. Furthermore, among the small group of musician respondents who say their careers have only been hurt by free downloading (n=138), 68% say they think the lawsuits will benefit musicians and songwriters, 17% do not think they will benefit, and 14% say they don’t know. Musicians download and share, too, but few think that has decreased the amount they spend on music purchases. Our highly-wired sample of musicians contains twice as many music downloaders, movie downloaders and file-sharers when compared to our data on artists and the general public. In all, 56% of the musicians and songwriters in our sample say that they download music and 34% say they download video files. Some 43% of these musicians say they share files with others online, such as music, videos, photos or computer games. However, in stark contrast to the data we have gathered from the general public, the majority of music-downloading musicians in our survey (58%) say they do care whether the music they download is copyrighted. Just 38% of music-downloading musicians say they don’t care much about the copyrights on those files. Half of these downloading musicians say that downloading has not really changed the amount of money they spend on music purchases overall and 42% say they think that downloading has actually increased the amount spent on items such as CDs, concerts or other music products. Less than 10% think that downloading has decreased what they spend on music purchases and 2% say they don’t know. We also asked both music downloaders and video downloaders (n=1,595) whether they had paid anything the last time they had downloaded a file, and if not, whether they had permission to download the file for free. More than three-quarters of the sample (79%) say that the file they downloaded was free, and 18% say they paid to download the file. Of those who downloaded a file for free, 40% say the copyright owner had given permission, 13% say the owner did not give permission, and 26% say they don’t know, remember, or refused to answer. More than three-quarters of these music and video downloading musicians say that even if they download media files for free, they usually end up supporting the artist or author in other ways, such as buying a CD or book, or going to a performance. Just one-third of these musicians say that the high price of most media content justifies downloading files from the internet. Musicians have a wide range of ideas about how to best address the unauthorized distribution of music online. A surprising number of respondents said that peer-to-peer file-sharing is not the problem, but that it is a symptom of bigger structural issues for the major labels. Many respondents suggested that the music industry needed to recognize the changes that peer-to-peer and digital entertainment in general have brought to the music industry, and change its business model to embrace it, instead of fighting it. Another batch of respondents used this question to talk about the need for artists to control their own music. While negotiating control over content is difficult in a digital environment, many artists suggested that decisions over peer-to-peer file-sharing and digital distribution should be made by the artist, not the label. Furthermore, there is some confusion among these musician respondents about how peer-to-peer networks function. Many thought that there must be a technological or legal remedy that would allow copyright owners to “shut down” or “limit” P2P sites, thus stopping the piracy at the source. Others thought that there might be a way to “limit” how much copyrighted material an internet user can download. However, peer-to-peer systems are not Web sites at all but a distributed network, so control at the ISP or web hosting level is not feasible. The answers in the “Punitive” category range from palpable anger, to joking, to agreement with the RIAA’s current legal strategy of suing individuals who are sharing substantial numbers of files. There are also many who suggest that the best approach is to punish the peer-to-peer services that facilitate this kind of trading instead of the consumers. At the opposite end of the spectrum are those who think that no remedy is needed. These are the respondents who tend to say that file-sharing is good, that it has helped them with their careers, that music should be free so stop trying to crack down on peer-to-peer, or that the biggest victims are the major labels that need to revise their business models. In the middle are those in the “Accept it” category who are resigned to the inevitability of unauthorized distribution and think it is best to work with it, rather than against it. Others are more positive and see peer-to-peer not as a threat but an opportunity for free promotion. Many in this category thought that the music industry’s campaign against file-sharing was not the best approach and that they need to embrace peer-to-peer and work with it to promote their artists. Finally, many diverged from the discussion of peer-to-peer altogether and talked about structural problems in the music industry – the price of retail CDs, the bottleneck on radio promotion, contract terms – to say that the music industry needs to adapt. Those who fall into the “Business/Licensing” category say that the iTunes model of a pay-per-play store or the Rhapsody-style subscription service is the best solution – something legal, convenient, robust, and fairly priced. There was also a notable amount of support for Weedshare – an incentive-based system of restricted file-sharing that allows the artist to be compensated as the file gets traded more. This section also includes many respondents that articulate the basic idea of alternative compensation systems – those that track the files, or suggest that ISPs or peer-to-peer services add a monthly user fee and pay the artists based on usage.